With a Rivalry game this past weekend, I decided to get into the Spirit…. Which does work wonders by the way,.. 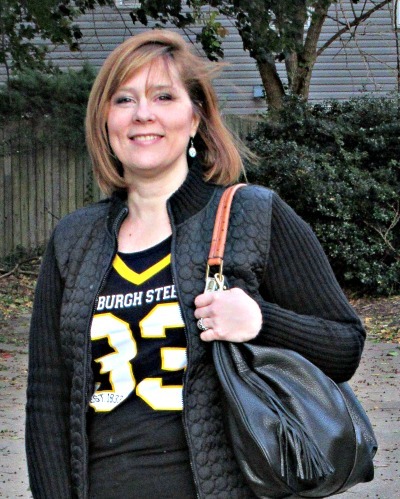 I even wore the Steelers earrings my kids picked up for me last year…. So glad it ended in Steeler favor cause I really don’t like the Ravens… Like every game between these two, the guys went off the charts and were brawling… seemed more like a hockey game than football at one point…. So chime in Dear Readers, What do you think about retailers doing specials on Thanksgiving Day? Will you be going? I am grateful that my children are all doing well and are healthy. I am grateful that my children are all connected and text each other. I am grateful that my sinus issues today, never ventured to a pressure headache.